CD Catalog Software WinCatalog 2018 allows you to automatically create a catalog of CDs and files from your CD collection: automatically grab ID3-tags for music files, thumbnails and vital info for video files, Exif tags and thumbnails for photos (images), files inside archives, ISO files, and more. You can also specify a location of each CD, adding this info to special fields of a CD catalog. Your can organize your CD catalog, using tags (categories) and virtual folders, and find files in seconds without inserting CDs to a computer. With WinCatalog 2018 CD Catalog Software you will handle your CD catalog easily - no matter how big your CD collection is. "I've purchased WinCatalog recently and haven't used it much (so far only cataloged about 9 cds) but I can definitely see how professional the software is. I will provide more feedback as I add more of my tons of cds...!!!" "This is the best program I have found that can catalog all of my cd's and hard drives. A+"
WinCatalog 2018 is database driven CD catalog software. It uses industry standard SQLite database engine in the core. This helps to operate with a CD catalog of any size. No matter how many disks: CDs, DVDs or Hard Disks, files or folders are stored in your catalog – WinCatalog 2018 CD Catalog Software will handle all of them! WinCatalog 2018 CD Catalog Software can create picture thumbnails for most popular image types (like jpeg, png, bmp and others) and store them inside the catalog. The thumbnail previews are available even without the link to the original files, so if you search for a photo or picture, you can preview it BEFORE reaching a CD or a DVD! WinCatalog 2018 CD Catalog Software fully supports Unicode. No matter in what language your CDs, files and folders are named. WinCatalog 2018 will correctly catalog all of them. In additional to Contact manager and Tag manager WinCatalog 2018 CD Catalog Software has a new Location manager which helps to manage physical locations easier. You can add all locations, say “box 1” or “cd wallet 2” and associate every CD or folder in the catalog with the location. This will help to easily find necessary CDs. 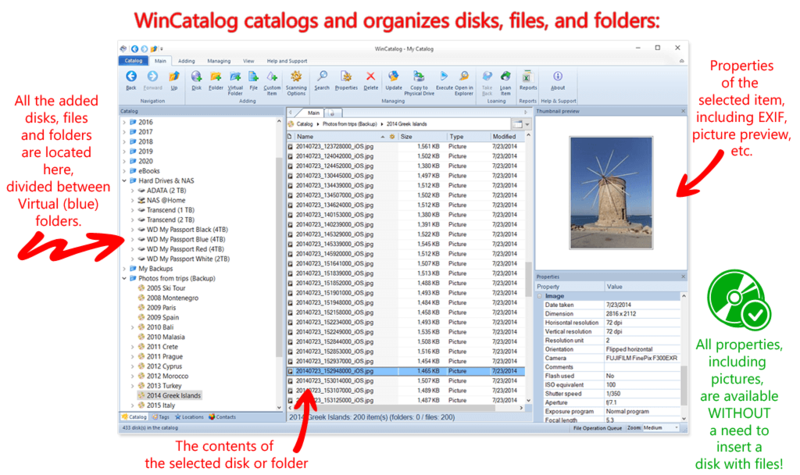 WinCatalog 2018 CD Catalog Software has a tabbed interface which allows you to keep several various search results simultaneously.